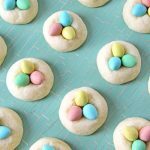 Make these Easter Egg Sugar Cookies for Easter! They’re soft, chewy and so delicious! Bake for 10-12 minutes, or until edges of the cookies are lightly browned. Remove the cookies from the oven and let cool for 2 – 3 minutes. After this time press 3 small Easter eggies into the middle of the cookies. See notes. Make sure you give the cookies enough time to cool down. If you move them too quickly, the Easter eggs will crack.